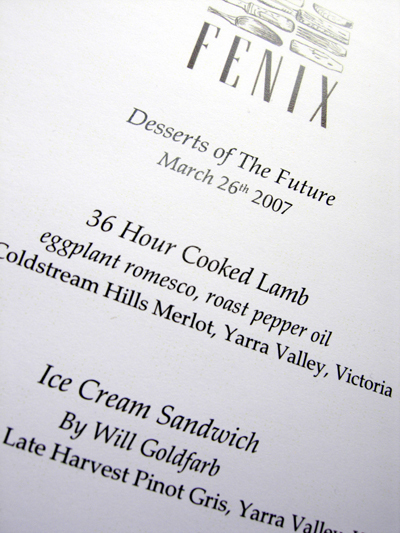 Part of the Melbourne Food and Wine Festival this event was called Desserts of the Future and was hosted at Fenix. We're in the same room as last night but in a totally different combination and by the number of seats, it's the biggest event to date. A last minute arrangement has seen Will Goldfarb from New York's Room 4 Dessert prepare a special dessert from his restaurant. Before we begin Will is introduced and gives us a look at his venture into Second Life. 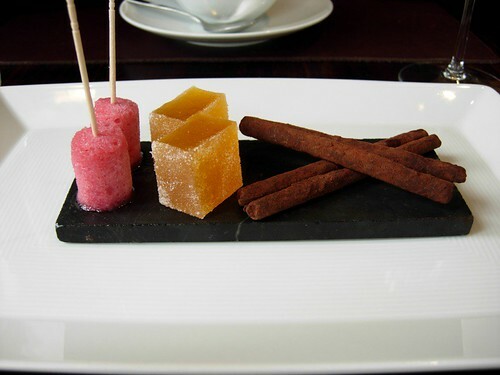 Second Life has certainly been making the news of late and Will has created a way to virtually try 5 of his most well-known desserts. For a mere 1 Linden you get a dessert which is actually the recipe. Paalo is already planning to visit as soon as we get home and I can't wait to see the recipes! Paalo comment follows: and I did. go to mama sugar and maybe you will bump into me, I'll haunt it for a while to see who turns up. And I have the recipes though I can't understand them! The lamb is lamb neck and it's fork tender which a rich flavour. 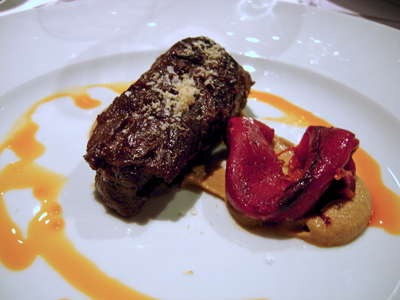 The eggplant romesco is the puree that sits underneath the lamb and we're also treated to a piece of roasted red pepper. A most satisfying dish to begin our journey. 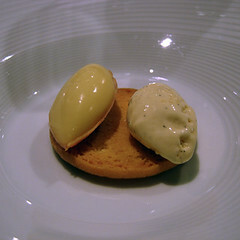 To the left is a quenelle of Epoisse cheese and the to the right, vanilla ice cream with smoked salt both sitting atop a sable biscuit. 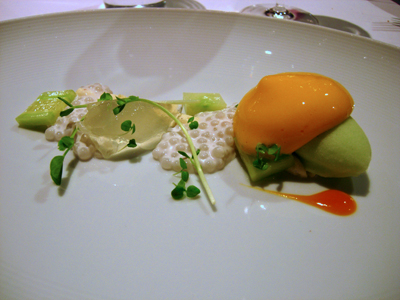 The vanilla mousse is presented as a tube that runs the length of the plate - on top of it rested squares of cucumber, coconut tapioca, lime jelly, cucumber sorbet to the right just under the mango foam. We've had variations of this dish at Fenix and I've loved them equally. The tapioca is a real eye-opener, for something that once was so commonly used it's now a rarity and eating this just makes me want to cook with it. This is a clean dessert and in balance - there are sweet elements, savoury, sour and doesn't leave you feeling as you've eaten concrete. It's a refreshing way to end a meal. There's been a bit of historical research done for this dish, discovering a variety of potato that was known for having hazelnut flavours. 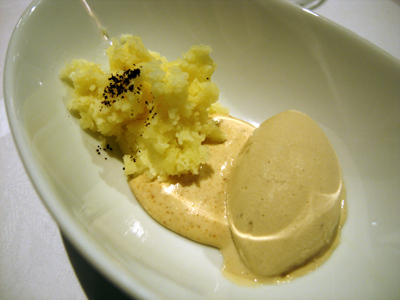 It's presented here as a "rough mash" to one side of the coffee ice cream - joining the two underneath is the hazelnut sauce. This is probably the dish that most people were unsure of - some would have liked the potato to be presented as a smooth mash. I think the trouble is ridding people of the idea that only certain ingredients can be in a dessert and conversely only certain ingredients should be in a savoury dish. As a devoted potato lover, what else can I say but that I loved it. This is another dish that we've seen variations of in the restaurant and it's one that really won over our table. It might well have been the pick of the night. I must say it refreshing when compared to last night, that the people here tonight were really open to trying new things and weren't passing judgements until having tried the dishes. I especially like the vinegar hit that pops up through the dessert - it seems to be a recurrent theme, the dish is balanced. 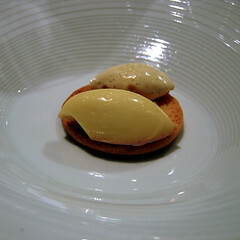 The modern desserts at Fenix looked like a real treat. I saw Raymond Carpaldi do the mashed Coffee Ice Cream, potato puree, hazelnut at Wicked Sunday at Fed Square recently and it looked intriguing. 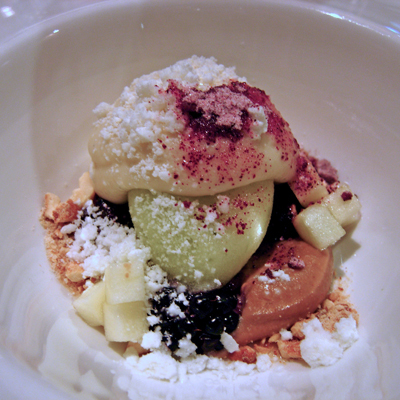 I also think the Green Apple Sorbet: parsnip, blackberry, cashew nut looks fantastic and it makes me curious as parsnip is one of the few vegetables I've actually never liked. Looks like an exciting night! 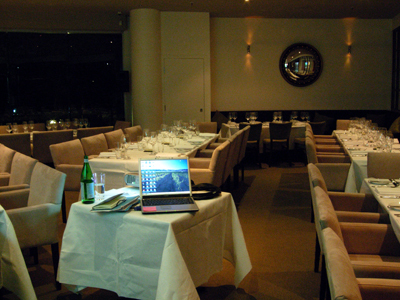 Hi Lauren - it was a great night and I think, at least in the table we were at, everyone really enjoyed their experience. I totally understand about parsnip, it's not a vegetable I really like, but in this dessert it's lovely and I happily eat it. The dish sees parsnip return to it's original use - as Ray explained Parsnips used to be used as a sweet but at some point this changed and it became as we know it today, a savoury vegetable.